The news that Ikea is opening a delivery depot in Charlottetown, one of five new such sites in Canada, has likely sent many would-be interior designers on P.E.I. into overdrive — and there are ways you've never dreamed of to use its cookie-cutter furniture. The news that Ikea is opening a delivery depot in Charlottetown, one of five new such sites in Canada, has likely sent many would-be interior designers on P.E.I. into overdrive. Customers will be able to choose collection point delivery as an option when they shop online. There will be a flat fee of $59 charged for delivery to the collection point, no matter the size or value of the purchase — a much better value than the average home delivery fee of $155. Flipping through the virtual catalogue of reasonably-priced Swedish minimalist furniture and housewares can be inspiring, giving you "fresh ideas for every room" as the company's tag line says. But what if you want your Ikea stuff to look different than the millions of others who've ordered the same Billy bookcase or Lack side table? That's where hacking comes in — modifying Ikea furniture to make it your own, whether it be with a simple coat of paint or more involved modifications that include power tools. Ikea hacking has gone very mainstream: there's even an independent website called Ikeahackers that lists hundreds, from the most popular to the messiest. Here are a few fun and popular hacks for you to try. "Plain Jane wardrobes are aplenty at Ikea," writes Jules from Ikeahackers. "But that's nothing a little paint and decoupage can't fix. Here's a sweet one from Brett, an upgrade of the Stranda." She first painted the frame with two coats of high gloss paint over primer and then decoupaged wrapping paper on the door panels. The final touch were door pulls from Anthropologie. You can take this anywhere from vintage to retro to kid-friendly fun. Go! 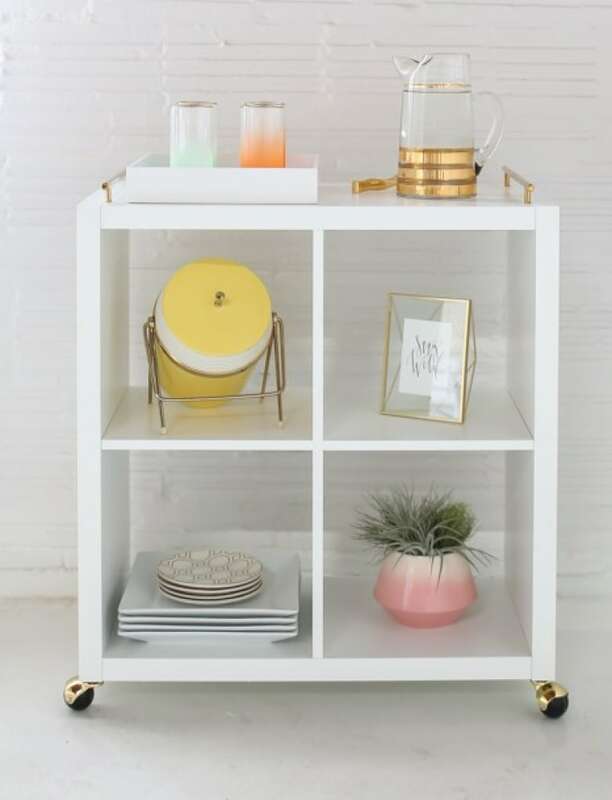 The blog Sugar and Cloth came up with this sweet little bar cart, which could have 100 different uses from portable dollhouse to homework cubby. They decided to glam up a Kallax book shelf with brass pulls and ball casters. They built the bookshelf as per instructions — patience is always required — then added the casters to the bottom corners. They even used a gold foil pen to colour over the silver screws so they'd match the chic brass. Then they flipped the shelf and placed long brass handles on either end of the top. Complete directions here, and note they rated this hack as "hard." There are so many ways to hack Ikea dressers, it's practically infinite. Clever entrepreneurs are even servicing the hacking market, with overlays or fretwork panels that fit right on to Ikea furniture — including myoverlays.com and the swedish site Superfront. You could also paint on lines that resemble overlays, or make your own if you're handy like that. Find a whole slide show of ideas on the blog Momtastic, where they link to the hack for the mirrored dresser shown at Cheapo Copy Cat. You will need the dresser, mirror cut to the size of the drawer fronts, some Liquid Nails or similar glue, and the aforementioned overlays. 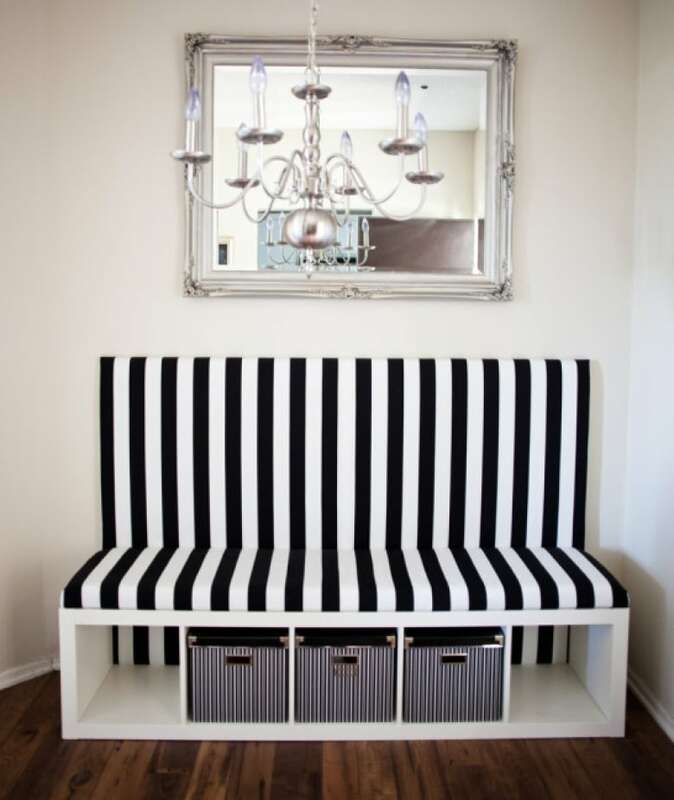 Use a bookshelf as a base for banquette seating, following instructions on the blog Melodrama. 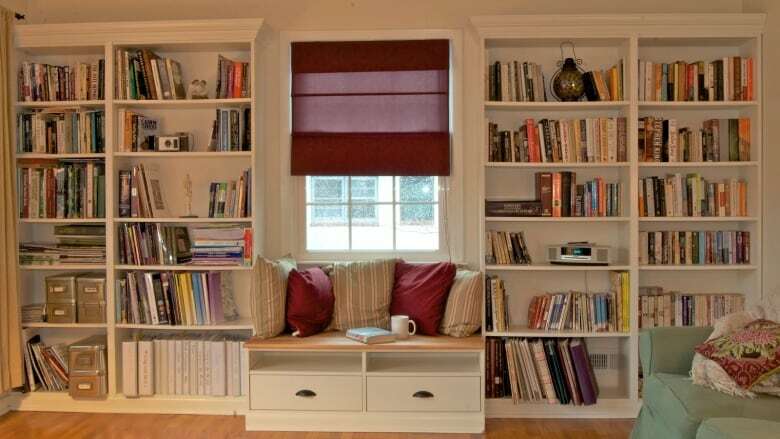 You'll need a bookshelf, canvas fabric, 2-inch foam and batting for the back and seat, MDF board and a staple gun. Your design can be as muted or bold as the fabric. Sometimes, Ikea furniture wears out, or breaks, or you get tired of trying to assemble it! In any case, you might be left with just a bed frame, and here's a really neat way to upcycle it. Find the directions on the blog Ich Designer, but you'll have to Google translate it — it's in German. 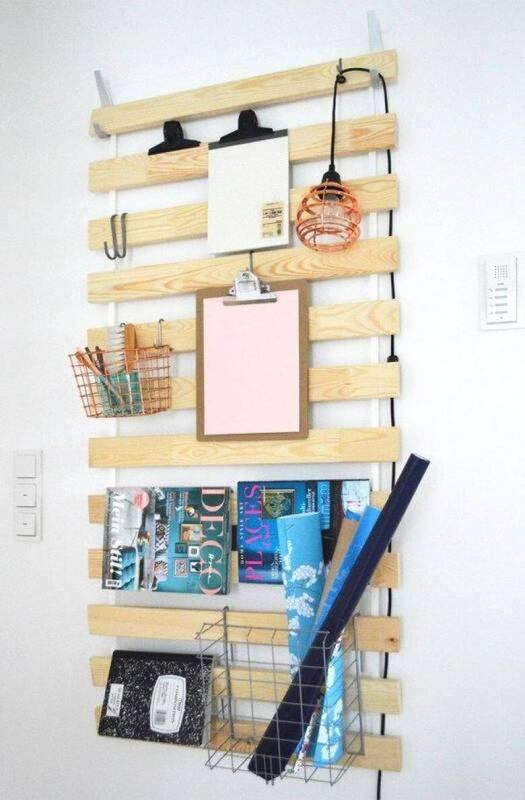 Want more Ikea hacks from the sublime to the ridiculous? There are tons of sites out there including gizmodo, Momtastic and of course, Pinterest — if you click, I'll see you next week!